On Sunday I worked outside in my garden for the entire day. It was so wonderful. The air was cool, there was a bit of a breeze, it kind felt a little bit like early fall. How lovely to leisurely move from flower garden to veggie beds, picking and pruning, planting and weeding, without being too hot and sweaty. matter how many years I garden, they still stun me with their gigantic, dramatic flowers. 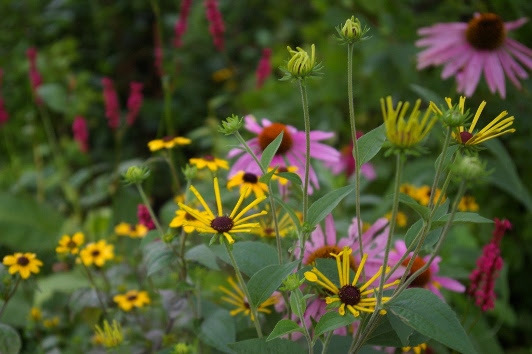 The daisy days of summer are here, with Echinaceas and Rudbeckias of all sorts taking center stage. Most of my summer phloxes are flowering, and I certainly took the time to sink my nose into each one. Such a soft fragrance, it speaks to me of summer. Joe Pye weed, ironweed, Persicarias in pink, coral, and white all weave together to create the most delightful tapestry everywhere I turn. 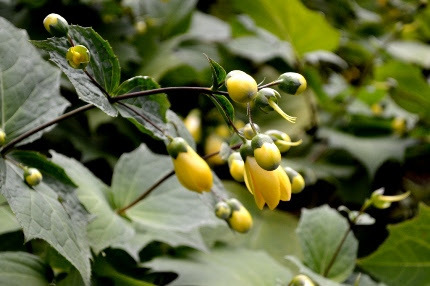 Kirengeshoma palmata is called waxy bells. It is one of our favorite late summer/early fall bloomers in our shade gardens. Join us on Saturday morning for a Shade Stroll at 10 am. This Saturday morning, we are offering a FREE garden walk, dubbed aSHADE STROLL, in our demonstration gardens. August in the shade garden can be challenging. Learn what we have in bloom, what’s still to come, and techniques to keep your shade garden happy during the summer and fall. The walk starts at 10 am. We will be serving herbal iced tea immediately afterwards. This is one of my favorite combinations in our gardens- wild and wonderful! 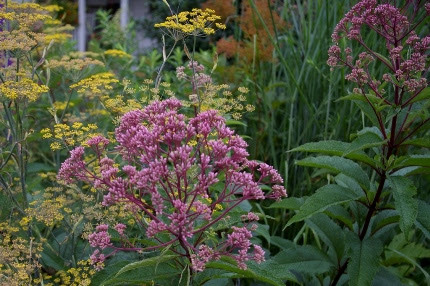 Joe Pye weed and bronze fennel work so well together. That’s Panicum ‘North Wind’ grass in the background. This Thursday evening, Facebook Live will focus on plant combinations or, as I love to call it, plant marriages. Some plants look good next to each other but don’t grow well together. Sometimes you just look at a combination and you think WOW! Why does that look so good? I will explain how to see this from a garden designer’s perspective. Tune in at 4 pm, or better, come and be in the audience. All of our Facebook Live videos are archived on the Natureworks Facebook page. It’s an easy and fun way to learn. 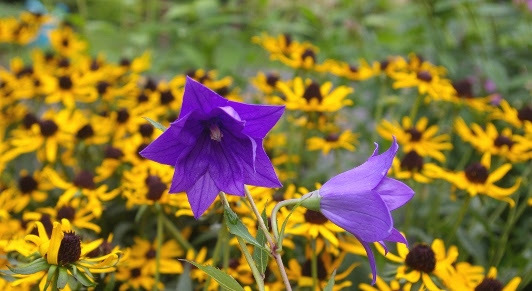 An unbeatable summer combo: balloon flowers (Platycodon) and black eyed Susans. paw or a blueberry bush? Seed in some fresh dill or cilantro? Pop in a package of bush beans? Fall crops are so important to extend the harvest. This week the moon is full and it’s the perfect time to plant root crops– carrots and beets immediately come to mind. Here at Natureworks, Veggie Island is an ever changing oasis of edibles. 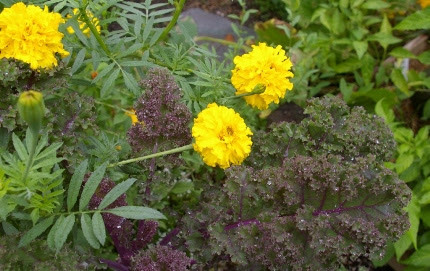 Speaking of pretty plant combinations, our kale is interplanted with marigolds. Flowers and food go together. In our perennial borders, you will find tomatoes, eggplants, peppers, and herbs tucked in everywhere. Such fun! plants (Calluna). 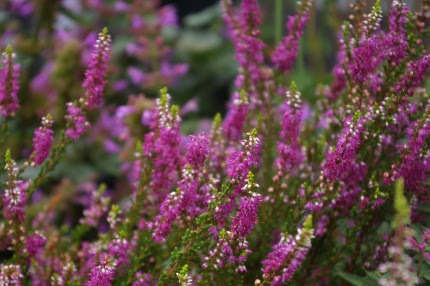 They love well drained soil and full sun and are low evergreens, ideal for slopes. I noticed the funky, yellow flowers of our native St. Johnswort are attracting tons of pollinators. I love ornamental Oregano ‘Herrenhausen’, a totally carefree perennial that the deer won’t eat. 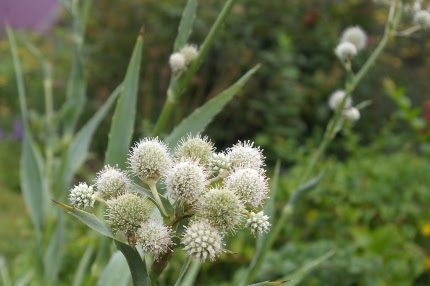 But probably my most favorite plant of the week is rattlesnakemaster, Eryngium yuccifolium. I fell in love with this plant while walking the High Line in New York city. Then I saw it in many of the gardens I visited in England last year. We put one plant in our hot, sunny rock garden by the road and this year, it has SO many flowers. 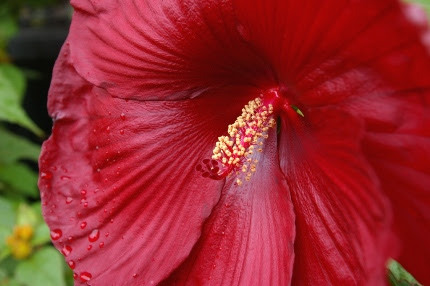 It is a good cut flower and it is always covered with pollinators. With the regular rainfall, the gardens continue to grow very fast. I am feeding my Smart Pots and containers every two weeks, like clockwork, and they are big, beautiful, and abundant. Crabgrass is starting to flower and I am on a mission to pull it before it sets seed. Even though the stores are filled with back-to-school supplies, it still surprised me to see a yellow mum in bloom along side my orange butterfly weed. Despite the challenges of fungus and cucumber beetles, I like this growing season. It seems like a kinder, gentler summer to me. I hope you are feeling the same way. Why not take advantage of the blessings Mother Nature bestows upon us and stop in for some fresh color and more edibles. Keep on planting!